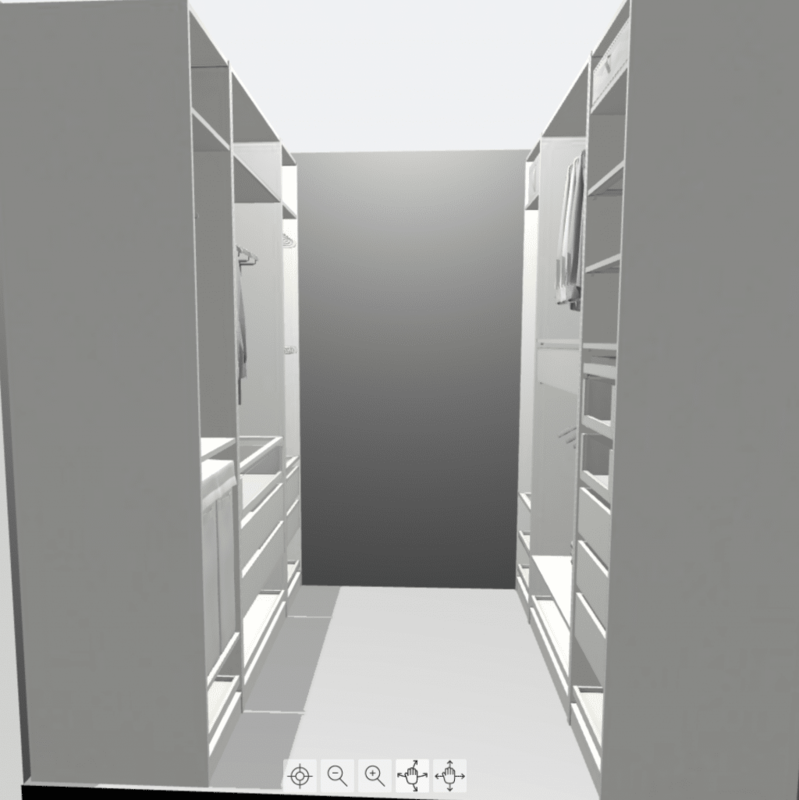 Designing Our Ikea Closet Might Kill Me. 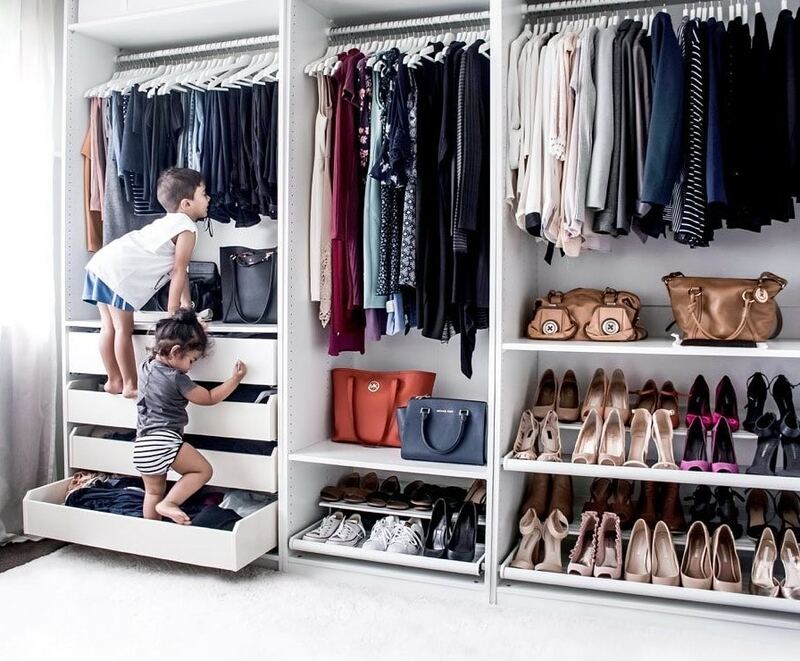 I need to be honest–we struggled designing our closet. 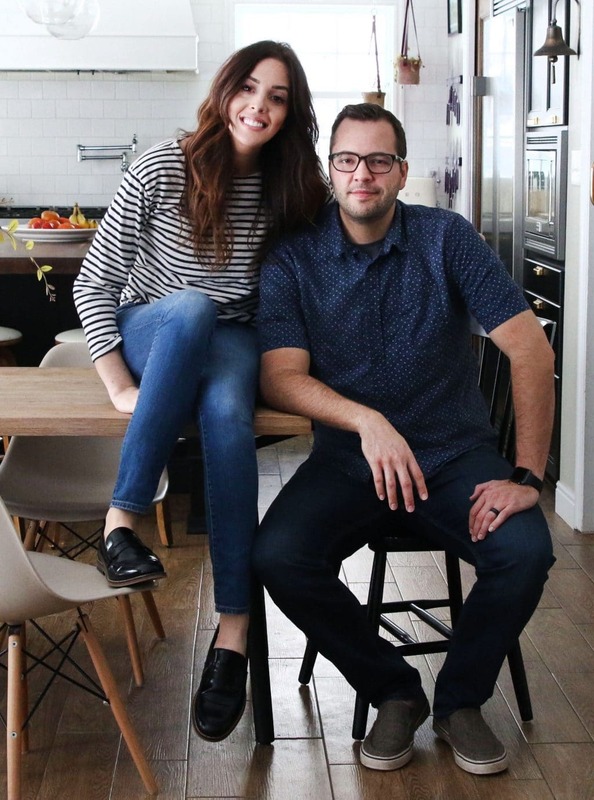 I think we always assumed once we had squared off corners in an open space (something we did during our bathroom renovation), it would just be easy and everything would come together. But then it didn’t. It could be that my brain from a lot of other design decisions, but we probably designed it 7 times before we stopped trying to fill up every wall with closet organizers and decided on a galley layout, with a system (we are going to go with the PAX from IKEA) on each side and a large floor mirror on the back wall. We’re spending a pretty penny on the bathroom renovation, so we really wanted to balance that by going a more budget route for the closet so we can still come in under budget on the whole thing–which is why we ended up with the IKEA Pax system. We used them in the girls’ room and absolutely love how customizable they are for a great price. But before we get into that, here are some IKEA PAX inspiration photos I dug up. All of these inspiration photos gave me great ideas of how all the different organizational options can be configured. But ultimately, we had to make a list of what we needed. I don’t have grand shoes or bags I want to display (quite the opposite for the most part), or tons of jewelry. I hang almost all of my tops, but prefer to fold my pants and Chris is almost completely the opposite. Here’s what our closet looks like now. Which does it terrible justice because it’s so much better than it was before aesthetically. It’s squared off now, has a nice, wide opening and has beautiful heated marble floors, but living off of clothing racks and gorilla shelves is kind of taking it down a notch (haha). We’re so ready to get this place organized. 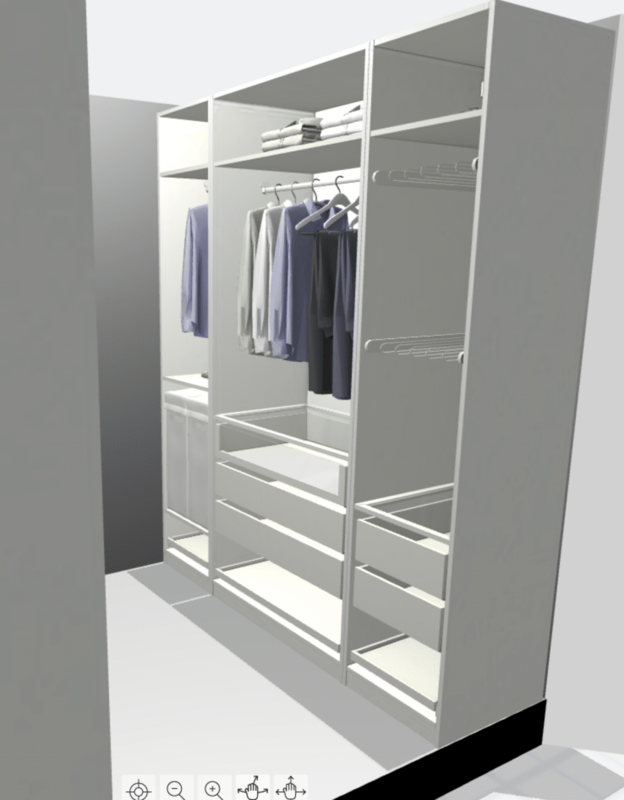 The dimensions of our closet are 7’11” (aross the back wall) x 6′ 7 1/4″ (on either side). Here’s what we came up with. Like I mentioned in the beginning, we tried so many different configurations to try and utilize every wall, but in the end, it seemed like our storage was maximized by doing a galley style. This leaves about 46 inches of walking space down the center and we’ll be able to hang a good sized mirror on the wall in here, which is a nice perk. My side is the right side. We have 8 ft ceilings and went with the taller 92ish” Pax Wardobes. In the first section (far right, in the front) I imagine folded jeans and lots of drawers for workout clothes, sweats, underwear, etc. On the very bottom of our whole system we put in pull out trays for shoes. In the middle section, I separated two hanging rods with a large drawer for tops I prefer folding, like some of my t-shirts and sweaters. To fit this, I had to bring the top rod almost to the top of the wardrobe. I’m tall (6′), and I’ve tested my reach, but I’m still a little concerned if this will be convenient in the long run. If I flip the image, you’ll see my last compartment which is for longer dresses. I also included a storage bin for more seasonal things, like swimsuits, and two pull-out shoe racks (although I think I’ll make one a shelf just so if I don’t need all the shoe storage it can be used for something else, too). Over on Chris’s side, he has alllll the built-in pants’ hangers. I’m actually a little jealous. I tried to fit at least one rack in on my side, but I had trouble squeezing it in anywhere. He also opted for more storage up top, one hanging rod and ample drawer storage for all of his t-shirts. If you flip the image, you’ll see we added two hampers right in our closet and an extra hanging rod (probably for me). This section is kind of our trial section. We could put a pretty lidded basket in the corner of our room for laundry if Chris finds he needs more drawers or I just really want some pants hangers after all. But I love the idea of having two hampers, for lights and darks, right here. I imagine we’ll put a rug under foot in here. And I just ordered this pretty pleated light (on crazy sale!). But there’s still one thing we’re still undecided about–do we want glass doors on the wardrobes? There’s no door leading into the closet. The pro would be it keeps everything looking orderly. The con could be that it gets cumbersome to access clothes. We are going to noodle on this plan for a good week before making the drive to pick it up to make sure we still feel good about it, but we’re so anxious to get it installed! What do you think? Do you have a Pax system? « What We’re Doing with IGTV! We just installed a Pax system in an open room without a closet. We put frosted glass doors on for that reason and it looks beautiful! In your configuration, I bet doors aren’t necessary….although they will hide any “mess”. We have a similar size closet and it never occurred to me to do gallery (DUH!) We went with the shallow versions and wrapped them around all 3 walls. 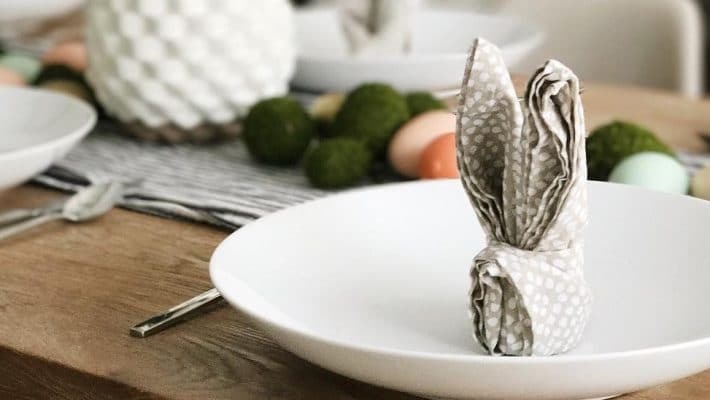 It is SO ANNOYING that the shallow version doesn’t have some of the cool options, like slide out trays, organizers, and certain types of drawers. I think you made a good call! Here’s what I’ve realized about closets: you adjust to whatever you have, and something in your collection will spill over. There is no way to predict that in ten years, you’ll be really into espadrilles and want seven colors. Or that you will get absorbed into necklaces and need more space for those. Building a reasonable closet will force you to keep editing, but unless you keep adding on, you will always outgrow it in some aspect. I have a PAX wardrobe independent of a dedicated shoe closet and have to periodically edit and purge everything to have space. And need a bigger clothes closet! I’m SUPER late to the commenting party, but I’m surprised you’d choose the Pax system over the Algot. I realize that the Pax system allows for a more built in look, but I don’t love the extra room that the frames take up. I just find them unnecessary unless you really don’t have a closet and need a fully enclosed wardrobe. I’m slowly redoing all the closets in my house with Algot components and have really loved the results. Super customizable and flexible. Maybe not as potentially beautiful as Pax, but I find the Algot system just works better for me overall. I live in a small old house and I have to take advantage of every square inch of storage I can. Excited to see how your closet turns out! Patricia again; found a pin that demonstrates what I was talking about. LOVE this idea, so cool, so much extra storage! I had that tall rod and I’m only 5’2″ and with the help of the hanger I could reach so I’m sure it will be fine for someone your height. Would definitely go no doors, seems like a pain to have to open them to get into your drawers. Speaking of drawers, you can never have too many! Just a thought about the end wall w/ mirror… have you considered building out a frame on the wall and hinging the mirror on it like a door? Inside you can have racks or pegboards or rails for accessories like necklaces, scarves and other cool stuff? As long as your mirror isn’t massively heavy, it can be supported by a piano hinge. You can also recess between the studs for extra space. Check pinterest. I’m sure you’ll find great examples. I was thinking about this again as I got dressed today. I measured our top hanging rod at about 7 ft. It has not bothered my 5′ 3″ self once, and I actually prefer hanging my clothes up there. So I’m thinking you’d be totally fine with that high rod. We used Pax for our walk-in closet many years ago and still love it to this day. We had the same dilemma as you because the only make specific width cabinets you have to try to make them work in your closet. It drove me crazy but I finally figured out if I used one of the corner cabinets in one of the back corners I could fit cabinetry on all 3 walls. The bonus is we used a mirrored door for the door on the corner cabinet so we have s nice big full length mirror and that cabinet was great for dresses and to store a hamper. I have a pax walking closet that we did ourselves and I love it. We were going to do custom built closet first with 8k quote and end up doing it with Pax for around 2200 dollars. I have narrow closet also and we end up doing back wall and both sides. We went with 22 inch deep one side and back wall and one side we did in narrowed depth ( I can’t remember but I think it’s 14 inch deep) which is perfect for all your folded clothes. If you don’t mind sharing you both could use 22 inch deep side and use top for his and button for hers on one side to hang and maybe narrow depth cabinets side for folded clothes? That way you could use back wall as well with a corner unit? I like the idea Olga presented – if you don’t mind sharing sides, then having mostly hanging clothes and shoes on the bottom on side and all drawers and shelves on the other could look very nice. Especially since a previous commenter noted having all of the shelves or drawers at the same height would really clean up the look. Imagine if one wall was all drawers at the same height it would (as also a previous commenter noted) give the illusion of a dresser, while the other wall had all or almost all of the same height rods and bottom shelving. You could still have “his” and “her” sides, but it would just be on both sides of the galley instead of all along the same wall. Also, if you placed the drawers and shelves along the same wall as your sinks, then your line of sight when you walked into your bathroom would be a bit more streamlined rather than seeing hanging clothes. Whatever you do, we know it will be as beautiful and functional as everything you do! Can’t wait to see the results! units with 15″ drawers wherever clothes are not hanging. The 2 units that will be next to the 24″ deep pantry units will have shelves instead of drawers because drawers would pull into the side of the pantry unit on the end wall. Not sure how to attach link / picture of my Ikea “kitchen” plan. Yay…I can’t wait to see when it is done! We didn’t use PAX (I led the design and we used More Space Place) but since it was recently installed I thought I would share the favorite parts of my closet – since the layout is verrrrry similar to yours. (1) we added a sliding pocket door with frosted glass between the bedroom and closet – and we love it. Our set up is actually a walk through to the bathroom so that sliding door creates a “walk in” closet/dressing room effect and still lets light in. (2) I put my drawer section (4 drawers below including a jewelry drawer) with frosted glass upper cabinets (which contain pull out shelves for shoes/boots – so they are hidden from view) in the corner you would see when you walk into the bedroom and approach the closet. That way – the first thing you see is pretty and clean – no clothes are showing. I love that no shoes or boots are showing/collect dust. (3) We made sure the closets are 24″ deep – so the clothes don’t stick out into the closet space – it just looks neater. 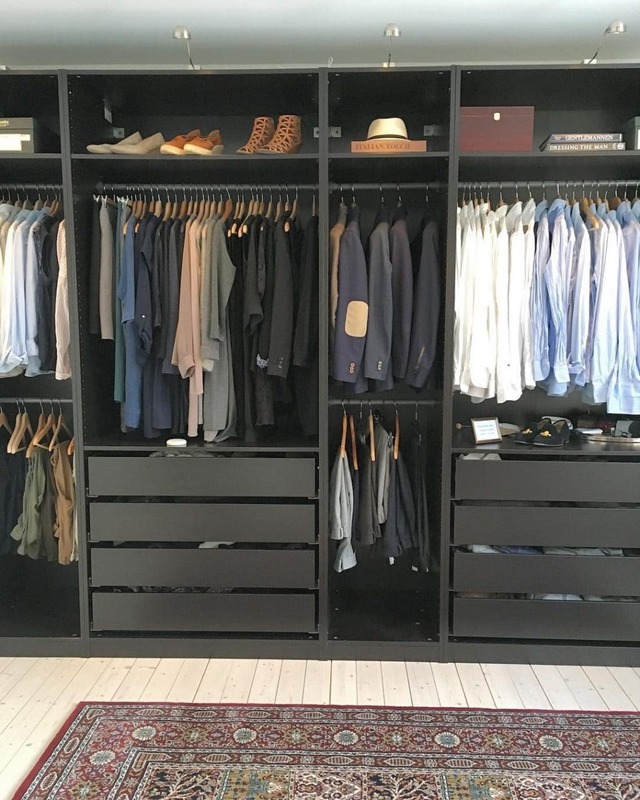 (4) Pull out pant racks are a game changer – love them! (5) We eliminated the laundry hampers as they seemed like a waste of space and incorporated open shelving and hamper storage (a Steele hamper from Anthropologie so it looks cool) into the master bath. 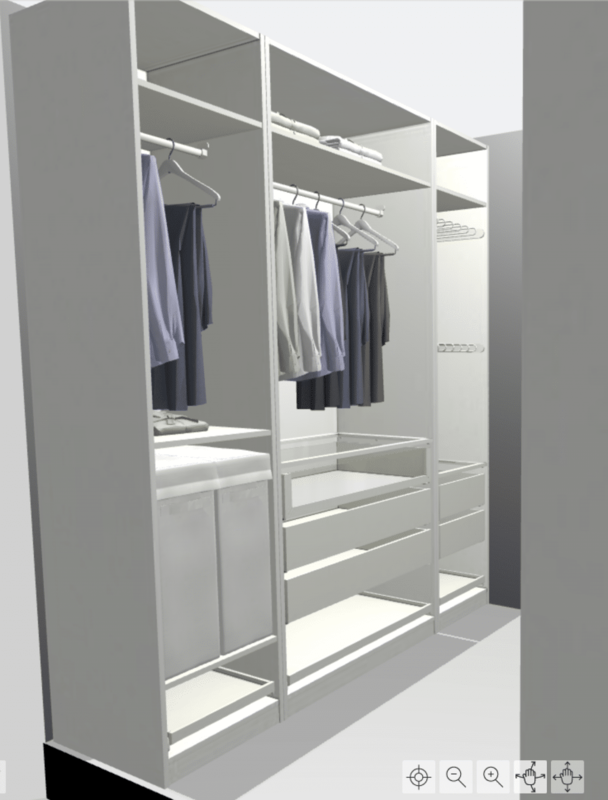 Hope you enjoy your closet – it certainly isn’t as easy as it seems to create the perfect closet! I got a lights basket/darks basket about a year and a half ago and I’m obsessed with it. It may sound silly – but for me, it just cuts one more step out of the worst task ever: Laundry. We changed our similarly sized closet to a galley style and I love it! I say 100% no doors, but I’m also the woman who drives her husband crazy because 50% of the time I forget to close the kitchen cabinet doors! lol I’d suggest a barn style door hidden on the inside of the closet to close the whole thing off if you’re worried about cleanliness. I think you have the hamper situated closest to the bathroom entrance, which I would suggest. I know I usually undress for a shower in the bathroom so my clothes end up on the bathroom floor- having the hamper right there would be the most convenient. Looks great! I have the pax system, the hamper inside makes the room tidy. The one change I would recommend is for shoes. We have drawers, which means you can fit more inside. The pull-out shelves don’t actually allow for as many pairs as you’d expect. So especially for sneakers and sandals I prefer the drawers. Maybe a pull-out shelf for pretty heals? Would recommend doors so you don’t get dusty clothes or moisture from the shower. We have sliding and like them! Oh I love the idea of drawers!! And I love the “felt-inlets” for accessories! I have a white Pax system with doors and think they look beautiful and are functional. Just a couple things I wish I had known before I bought them: My main complaint is that some of the drawers near the door hinges can be hard to open and can even scuff the drawer sides. Strangely, the doors are really heavy and you need two people to install them. One other thing–are you sure this is enough storage for all your stuff? The Pax can sometimes cause you to lose a couple inches due to the frames and the gaps between drawers sides. I was surprised how the pax didnt hold all of my clothes even though I had measured and planned. I ended up dropping the jewelry tray to make room for more shoe space (i still havent figured out a great place for boots to stand up instead of fold over!) I also found that their built-in features like pant racks, drawer organizers, laundry bag slides, and shoe racks took up more space and didnt hold as much as a rod with hangers or a pull out tray/drawer. Lastly we hide the kids’ Christmas gifts in the closet, so having the solid face doors instead of only glass front can be helpful. Contrary to most of the folks on here, I’d like to suggest that you may want to consider copying one of your inspiration pics and doing the back wall too. I think you will be surprised how much you use it because we always underestimate how much stuff we have and will have in the future. If you end up not using it in your closet, you could always sell it or move it to a different part of the house or the lake house. Good luck! My brother and I had Pax wardrobes when we moved back with my parents for a couple of months. I would recommend leaving them without any doors, since they are quite heavy and they don’t align perfectly if the floor is not leveled (idk if you have that problem) but it drove me crazy to see the doors a little crocked. Plus everytime I wanted to take something out of one of the drawers I had to open both doors completely or the drawers wouldn’t open, I just found that a little impractical. I have a PAX in both my and my husband’s closet (I know, separate closets, I am a lucky girl!) and I will say we were both pumped about the pants sections too. So practical, so much storage! In practice, I am actually not a huge fan. They don’t pull out as far as you think they will and lining them up perfectly every time is sort of annoying. Part of that is I try to fit two pairs per hook, not just one. I wish I had just used my same slim felt hangers and a regular rod there. Also the storage bins on top shelves are super helpful, they are a bit high (I am only 5’3″) but I can grab that handle to get things down. And YES to laundry sorting in your closet, it is so nice! I use the mesh drawers for that in my system (they pop right out and act as laundry baskets) but either way, it’s a dream to have everything presorted! Our house had a ‘custom’ closet when we bought it, and the corners are definitely wasted. That high hanging rod looks fine, I imagine out of season things on it. I can’t tell from the picture, but is there room on top for extra blankets or suitcases? That’s something we have and I love it. We have a very similar layout (open closet- galley style PAX arrangement) and we do not have doors on the PAX for two reasons- 1. The additional cost and 2. Even though there was clearance for them to open we envisioned them banging into each other and causing more of a traffic jam than the good they did. Plus no just sneaking open a drawer to get out a pair of socks or swimsuit. Also- you can always rearrange the guts of PAX if it isn’t working out to your satisfaction so maybe that will relieve some of your stress to nail it the first go around! I think doors on all the components will look and feel cluttered. Can you add a door to the closet entrance? We installed a pax system in almost the same configuration as yours! One thing I forgot to plan for was tall boots but i ended up storing them below my long dresses. Also obsessed with their felt jewelry drawer. It is super slim and I wear lots of small studs so having them sectioned horizontally is amazing for organization. We left our main closet door off for a while but I don’t have a tight color story type wardrobe so I got tired of how busy the patterns and colors looked and put the door back on. Excited to see your project! I have a bunch of PAX units and I would definitely go for some kind of door on the closet entrance instead of doors on all the wardrobes. I think with 48″ down the center, opening doors will definitely get in the way if you’re both trying to get clothes at the same time. We recently completed our master bath/bedroom/closet reno, and luckily our contractor pretty much gave me a suggestion for the layout and I made minimal tweaks. I’m very happy with it. We also went with small, clear glass pane french doors – it was originally a bi-fold door, and our contractor made them into french doors, painted them a glossy black, and I chose satin brass cabinet hardware for the knobs. Personally, I love the design element they add – open or closed, they’re really pretty. Thanks so much for the post. I was talking to my husband that we need to make a closet because our is a disaster, we don’t even know what we have! 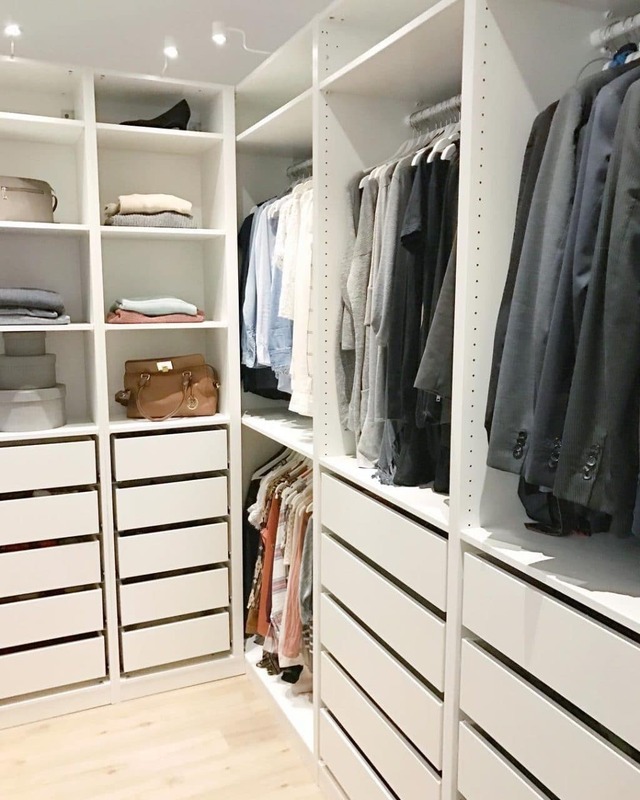 We don’t have a big waking closet but i think this post Would help us very much to create a organize and neat closet. Once again thanks. We recently did our closet over and the thing I like most is the drawers! I love them for work out clothes, sweatshirts, swimwear, night clothes! It’s just so nice to put them away and close the drawer. The other thing we love is the pull out hamper. The BEST idea. No doors! We have the pax and love it, except the doors. Despite adjusting it 100 times, ours doesn’t stay open well, and always bumping into the drawers. Plus, it’s annoying to have to open both every time. Could you do a pocket door at the entrance? Then you could close the whole thing off if you wanted to. I have two lax system wardrobes in my bedroom. I live in London, no closets. One had four opening doors and one has two large mirrored sliding doors. I love these wardrobes! In my opinion it would be fine for you to have doors on yours if you’re not doing a door on the closet. You’re bathroom is gorgeous and the light you ordered is beautiful so I think having doors on the lax system will elevate the closet to match the rest of the bathroom. Imagine takin a shower and looking into your closet…do you want to see clean lines or would you be fine seeing all your clothes and shoes? That’s just my two sense. I also have folded all my jeans and t-shirts the Marie kondo way in my pax system and it was life changing! I agree with a couple other commenters that mentioned a stool. My mother has very high shelves and racks so for her it’s necessary in order to reach her seasonal items. She also sits on it to put on her shoes and I can’t tell you how many times over the years I’d sit there and chat with my mom as she got ready. Super sentimental. Lastly. Did you measure your shoes? I didn’t see space tall enough for boots. We measured before we built and it made a huge difference in how the rest of the closet came together. We have had Pax wardrobe for years now, and we update it and customize it all the time. It’s great! Now, on to your closet – as soon as I saw the plan, I thought that rod is too high :) So, yes I think it’s not gonna be practical for everyday use. I’m not very good with your metric system ( I’m European ), but I know you’re tall- I am 175 cm tall, so I think we are about the same height, and for sure that rod is too high to use all the time, and my advice would be to use maybe a divider insert for that middle section of your closet, so you can put pant hanger on one side and pull outs for shoes on the other side, above that you can put one wide drawer, and then rod on the right height. Yes! We do have a Pax and love it. We ended up mostly not using the top shelves, cause I can’t reach them and put things like winter duvets or other seasonal items in them. I don’t know your height (being European and not used to inches), but would suggest your rod not be on the very top. Clothing weighs a lot, and you’ll have to stretch your arms up and forward. Definitely not convenient, so consider just taking it down. Otherwise your plan looks great! Go for it, and I’d recommend delivery too. Many things are packed into two parts, so you could easily end up missing an important part and having to drive back. Regarding the glass doors: I’d try without them first. You can add them later if needed! Pax system is the only thing saving my sanity in a tiny apartment. It’s in my kitchen and I don’t have clothes contained in them (household miscellaneous instead) but they are so so effective at organizing. I feel you’ll love it no matter your design choices with the pax accessories. Also so adjustable even if or when you change your mind! I couldn’t decide what to do for our closet, so as a temporary solution, I put a curtain rod above the doorway and hung sheer curtains (just to hide our stuff). Glancing into the room, it looks like another window. It’s easy to get into, we didn’t need to figure out which way the door should swing, and it doesn’t require any dedicated swing space. Are the inspiration photos yours ? If not, please consider crediting the sources. They might have other great images we would like to see. All of the images are credited and linked at the bottom of the post. Perhaps you missed it? Hang your beautiful bathroom inspiration art on this wall! It will help dress up the space and be a focal point. Do you have any suggestions on how to neatly and effectively store shoes in a standard wall closet? We have been renovating an old 1950’s home and now no longer have the luxury of a walk-in closet but have WAY too many shoes. I’d love to not have to keep my shoes sitting on racks outside the closet, if possible. Help! Closets from that era were very small. Have you thought about only keeping current season in reach and use over door or origami shelf cubbies? If rod has spare room I personally went for a long hanging shoe holder… my new pup is a shoe klepto! If your shoes don’t fit well in the closet, store them outside the closet. Not on open shoe racks, but in a cabinet. Not necessarily in your bedroom, either, but near the entrance to your home, if you have a foyer or can make a foyer/entry area using furniture, or in any other place you have room for a cabinet. Somewhere near a chair you can sit to change shoes is good. You don’t need to use a cabinet designed for shoes – just something that works for you – that way, it can be a piece of furniture that looks good. I like not storing my shoes in my closet – the only ones in there area the seasonal ones or ones I need to wear only rarely – stored in plastic shoe boxes. Ikea Pax is the best! Our walk in is similar to yours and we also did a galley. At the end, I hung a full length mirrored jewelry cabinet. I trimmed ours out with base and crown and added a pull out outfit rod from another company for hanging tomorrow’s clothes on. It looks so custom and at a quarter of less of the big name companies. If anyone else is considering these, the pax planner won’t let you put standard hanging rods into the shallower system because they designed it to be free standing, in another closet, we bolted the shallower games firmly to studs and the rods work really well. Also, check into delivery. The price is pretty reasonable (one flat fee no matter how much you purchase) and they carry everything to the room you want it in. Definitely worth it! Love it, it’s going to be great! If you’re ok with moving the mirror (not sure about how flattering the overhead light will be?) I could see sinking one of those super flat, tall shoe thingys into the studs in place of it (Ikea makes one, also Container Store, etc.). It would be ideal to have a door on the closet entry itself, but even if you don’t I’d still skip doors as long as the visual clutter isn’t too bad and you tend to keep your clothes orderly/not packed in! 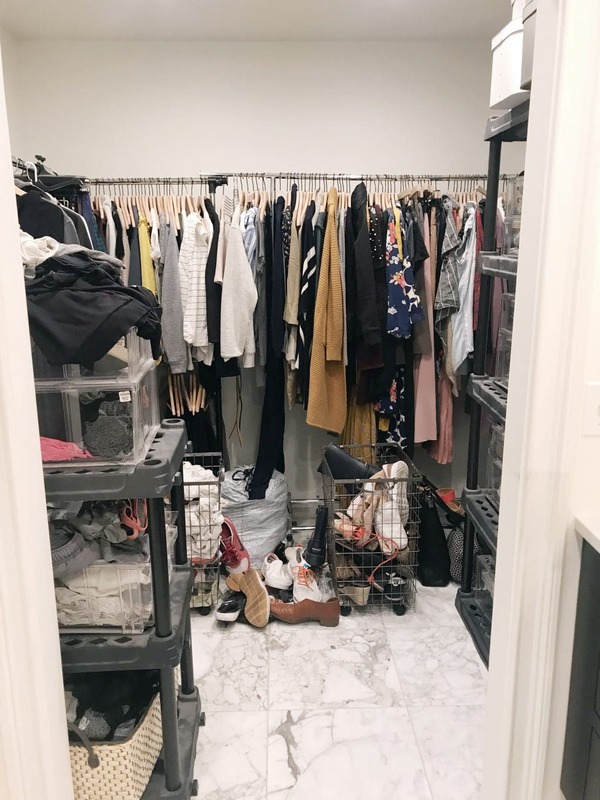 It’s just too many areas to be having to access… imagine having to open 3 cupboards, 3 drawers, and a shoe shelf just to get all your clothes for one outfit! Ugh. And then changing later in the day. I love my open closet despite hating visual noise because it’s colors I love and noise + ease of access outweighs quiet + frustration with doors for me. YMMV!! HOLY YES. So glad you mentioned this. The biggest reason we haven’t started our own master bathroom renovation is because of the closet. I just can’t figure out the best way to maximize space. It’s literally to the point that I, a professional designer and a huge supporter of DIY, am very seriously considering hiring another designer to do it for me. Why is is sooo hard?! One thing your inspiration pics have in common is that there is a consistency to the layout, mostly with drawers on the bottom up to the same height or a common shelf about midway throughout. It gives them a super clean look. Is there any way you could work something like that into your layout? Oooh, I definitely look at that more closely. Thanks! This is really smart. I wouldnt have noticed it if I hadn’t read that comment, but now that I’m looking at the inspiration pictures it does seem to really help elevate the clean look. This is what we did in our closet. The heaviness and the consistency of the drawers on the bottom really makes it much more pleasing and pulled together visually. It almost makes it look like dressers. We went with the black PAX and we love. I would stay away from doors for the reasons already mentioned- especially with a galley layout. Oh, and we separated the drawers from the rods with the jewelry organizer and glass shelf. We love! Yes, I was coming to say the same thing. We have Pax in our master closet (also laid out galley style with a mirror at the far end), and I recently rearranged some of the components to make it more consistent and am MUCH happier. I ended up adding 2 drawers, but all of the other pieces are the same, just laid out differently. (I hope this comment also makes you feel like you can change your mind about things. It’s not really hard to rearrange components, so you can always adjust down the road. Less pressure to be perfect!) And we have a pocket door going into our closet that we never use, so I’d vote for no doors. One thing I found is that I didn’t like having my shoes at the bottom running the length of the closet. It made it really hard to pull everything out at once to see my options. I ended up stacking the shoe pull outs one on top of the other and much prefer it. 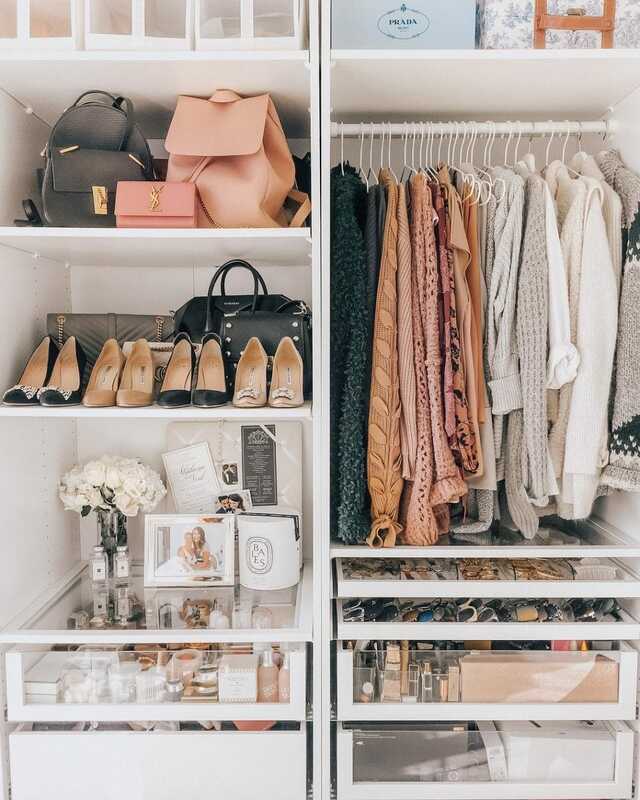 (So, in one of the wardrobes, I have a short top shelf, a taller shelf on which I stack handbags and 2 pairs of boots, shoe rack, shoe rack, shoe drawer (for sandals and sneakers), sweater drawer, sweater drawer, empty (!) drawer. If you’re interested, next to that wardrobe is a long handing area (we had a gap between wardrobes since the depth of our closet didn’t exactly match the depth of multiple Pax wardrobes, so our contractor built in a long hanging area), that also has room for tall boots at the bottom. Next wardrobe has long and short hanging over drawers (the drawers span about 2/3 of the width of the wardrobe). Next wardrobe has short hanging over drawers. Each set of drawers (including the ones under the shoe racks) are exactly 4 drawers high, and I love the consistent look that gives. Clean and cumbersome. I agree with another comment that it’s nice you can adjust the system down the road if needed. If you can plan a second trip before the return policy, you could over buy and switch different areas around to see how your clothing fits best. I’d also vote no to the doors because the doors have to be fully open in order to use the drawers or anything that pulls out so it’d be annoying to jump between sections while getting dressed. We had doors on our closet system. They lasted 2 months before I made my husband remove them and now they sit in the garage. It made my space feel larger too. With the doors on it felt so closed in and suffocating (we also have galley style). Don’t do doors!!! We have Pax in our master closet as well, same height you’re going with. I have a bar all the way at the top of one section like you’re doing and it’s honestly not a big deal or too high and I’m only 5’7”. I break out a mini step stool when I actually clean out my closet but day to day there’s no issues. Love the idea of doing the closet as a galley. I think the corners are such wasted space. You’ll have just enough room to open drawers on both sides at the same time without them touching. I vote no on the doors -it would just seem cramped and one more step to getting ready everyday. We also built in PAX in our master bath (bath, closet and laundry all in one room), and put in a hamper, too – so handy! We have had ours a few years and no issue with steam (no doors on ours). I would recommend just going with the regular clothes drawers instead of the shoe drawers. 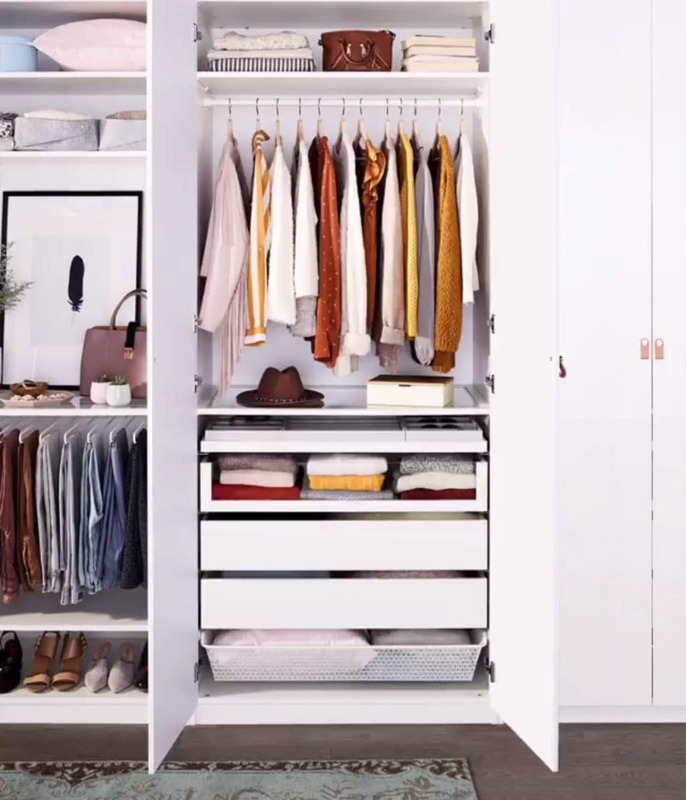 They take up about the same amount of space vertically, but the clothes drawers can be more versatile and you can potentially cram more shoes in! My husband has the shoe drawer on his side and the little metal rails don’t stay in place and are just a pain. I also prefer the cleaner look of a drawer front vs. the open look of the shoe drawers. Hope you are enjoying Des Moines! Since you don’t have a door on your closet, don’t you worry about the humid environment affecting your clothing? I understand your frustration with the shape of your closet. It can be difficult when trying to do a u-shaped closet. Two things. Have you considered using the closet system at Home Depot. It’s called closet maid. I’ve used them and love it. Anyway they have a unit made for the corner if you’re interested in the u-shape. 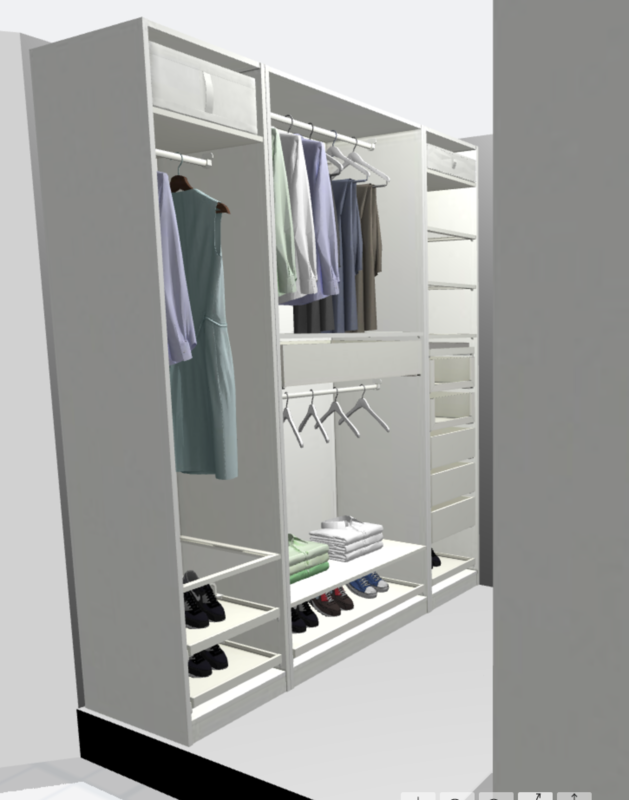 With the gallery layout it does seem you may have more floor space if you like to dress or undress in your closet. Last thing, have you considered just getting a consultation with someone like California closets just to see your options. We have pax in our wardrobe and we love it. We got the tallest and actually cut them down to fit the height of the room (there are tutorials online). No doors for us, the only “issue” with that is dust, but I thought doors could make it look a little sterile (plus we had cut the pax down so doors would have to be customized). It’s beautiful, i love my PAX closet! My only comment is, my dresses hung much longer than Ikeas little example dress in the pic (maybe i have a lot of maxis), so i didn’t have as much room as i planned underneath. Even w my shoes on the very bottom my dresses lay right on top of them. I bought a shelf for that spot and didn’t end up using it. My rod is placed about where you have yours. I would measure some of the dresses you planned to put there and see if you would care ab not being able to use the space below as planned. I think if you are jealous of the pants hangers it’s worth figuring out how you can incorporate those on your side. I know it’s totally personal preference but I much prefer to hang pants. That drawer in the center does seem to bother me, not sure exactly why. Have you counted the number of shoes you have to be sure they would all fit? Do you have a dresser in your bedroom? Just wondering if you could eliminate some of the larger drawers. I vote no on doors as well and love the idea of a mirror at the end. Great job! So this may be an odd question but… do you typically undress in your closet? Personally I find I get dressed in mine but typically get undressed in the bedroom or the bathroom so out closet hamper was usually empty – til we moved it! I say thibk about your current habits as they are the best indicators for your future choices. Good question and I had to think about it! I think it varies for me, but mostly undressed in the closet or bathroom. I can’t wait to go measure my master closet now & see if your system would work 😁 We just put the standard shelving in when we built because my brain was fried & so was the bank account! Our closet is very similar to yours, though we have a door on the closet we close when we shower to keep moisture out. Good kick-off looking forward go the reveal! I vote no for the doors, pax looks great without them and doors just get in the way. And yes to galley style. I used pax in my closet which is a walk-thru closet between master bedroom and shared hall bathroom. Since there’s not much wall space with two doors and a window, I only used the pax frames for the shelves and drawers, and then installed rods between the frame and the wall for hanging clothes, this way the rods could be any length necessary. I put pax shelves (cut to length) above the rods to mimic the top of the neighboring frame and installed baseboards around the frames; it looks super cohesive and built-in. Used every inch and saved money. Pax is amazing. In my experience, glass doors are only nice for pictures, not for reality. They still expose any disorder and only stand in the way of you accessing your clothes. Could you and Chris even open doors in your closet at the same time? It’s already a light squeeze in a galley style, doors seem like a much bigger inconvenience. Additionally, what about steam from your bathroom getting locked into the clothes behind the doors? Maybe they are more breathable than I am imagining, it just seems like a potential problem. Regardless, they are able to be added later if the need (not sure what it would be?) arises. So my point is, once you start living with the space, it is definitely possible to make changes so don’t stress too much. I love the layout you chose! And I vote no doors. Oh my. This is her job. If you are not interested in it please don’t read or comment. It’s comments like this that add to the negativity in the world, not take away from it. Enjoy your bubbles! “Might kill me…….” seriously…..
You’re right, we should all be dour and serious all of the time and not make any jokes until the world is 100% perfect. So reasonable, you nailed it. Just a tip, save your criticism for the people who will actually enact the changes you want to see in the world. Maybe next time, leave the attitude at home and go make someone else’s day brighter. Oh, Sonia. We are all here to look at/read about beautiful spaces. Take the criticism elsewhere. Looks reasonable to me! I vote no on the glass doors. It would look so pretty, but be so annoying I think! Is that something you could add later if you want? Did you go to the store to design this? I was online and had so much trouble figuring out all the options and pricing. I’m thinking now we’re going to just build out a closet ourselves and and then just build it around the ikea malm dressers. Did you consider doing something like that? We live about 3.5 hours from the nearest store, so we did this online. Is there a possibility you could add a closet door? After redoing my home by far the hardest most stressful thing was designing the master walk in closet on a budget! You guys are lucky you even have room for pax! 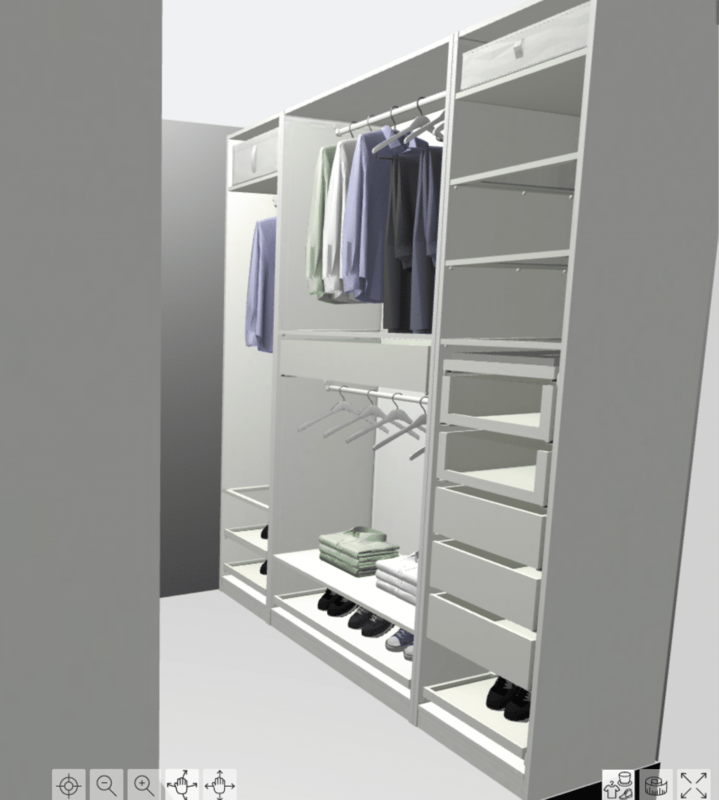 I tried designing the same kind of galley with pax but because my closet is so narrow I had only 15″ clearance between the units HA! I ended up having to use the less deep besta units for drawers. A total crazy complicated puzzle that kept me up at night for sure. I’m loving the idea of the hampers IN the closet. More storage always sounds good but I find it just encourages hoarding. Maybe just get the doors and return them if you hate it? Love it so far, super excited for you guys! All this planning is gonna be so worth it! Looks perfect to me! Galley style is definitely the way to go. It sounds like you’ve got it all figured out & it’s going to look so great! I can’t wait to see! Did you use SketchUp for these renderings? I would say no doors and if you feel you would like it later, you can always add them. The beauty of Ikea! Glass doors – any worry that shower steam may get in your closet? I imagine the shower steam getting trapped in closet doors and making clothes feel damp or trapping fuzzies from clothes on the glass. Also, fingerprints. Oh but I’m all about the galley style, blind corners are the worst! It’s gonna be great. I think the shoe shelves can be closer together, at least in my experience. I’m not a high heel person though. Also that high hanging rod does seem pretty high. Ours are in the position like you have in the other ones, with the soft sided storage tote thing on a shelf, then a row or two, then the hanging rod. I’m 5’ 6” and can reach this rod fine but only really with the help of the hanger.